With this being the first ICC senior men’s event in Australia or New Zealand since 1992, there’s been plenty of flashbacks to the last time everyone was here – the 1992 world cup. 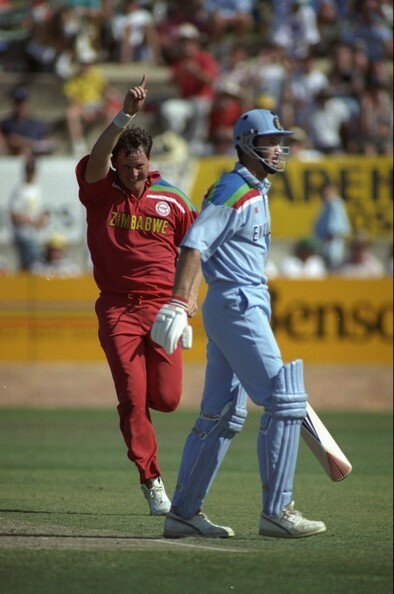 South Africa’s return to the international fold, the first time coloured clothing, white balls and lights were used in a world cup, and also the first time I ever went to an international sporting event – England v Zimbabwe at Lavington Sports Club, Albury on March 18, 1992. As a throwback to that era, replicas of the 1992 uniforms have been on sale at Rebel Sport. I scored myself a Zimbabwe top, in honour of their glorious victory on that special day in Lavington, and if they try and sell some cheaply as the tournament comes to a close I may try and pick up one for another nation. At the Boxing Day test, I wore my top on Day 3. Three guys a few rows in front wore Sri Lanka, South Africa, and West Indies versions. They waved and gave me a congratulatory nod when they saw we stand at a drinks break! The nostalgia even stretches to the Channel 9 advertising for the tournament – Ken Sutcliffe saying “who’ll rule the world” – which was the tagline for the ’92 tournament and even featured in a mediocre just-got-out-of-the-1980s theme song that was released to coincide with the event. If it wasn’t for the picture of the new post-2006 MCG on the ad, I would have accused channel 9 of recycling their 1992 commercials. Welcoming back games that matter! Some people think that ODIs will die soon with the rise of T20, but while ODIs continue to be the most profitable form of international cricket, that’s unlikely. Much like soccer’s friendlies, cricket’s international ODIs have become a bit interminable, as teams tinker with line ups and strategies. It’s not the end of the world if you don’t win the DLF Cup in India, the Carlton Mid Series, or the Haier Cup in the UAE. But now it’s World Cup time, so suddenly the games matter. I’m way more excited about Saturday’s Australia/England match than any other game of cricket I’ve attended in a while, because it means something! Given the test series are usually over by the time it gets to Melbourne, this is a rare treat! I love the world cup because we get to see some of the non-test nations appear. This Fox Sports article shows highlights of some great moments involving the non-test/minor nations causing upsets – and it doesn’t even mention Bangladesh knocking out India in 2007, Zimbabwe beating Australia in 1983, or Kenya making a Semi Final in 2003. While the bright orange of the Netherlands is missing, it’s great to see the Scots and the Irish here. The Afghan story to make it here is just phenomenal – have a read of this article for a great summary. I got to see the UAE play in a warm up game against Australia on Wednesday, and while their batting left much to be desired, their bowling attack wasn’t half bad. Here’s hoping one of the non-test nations can somewhow make their way into a quarter final. If they can’t, well, even one win by a non-test nation over a test nation would be a lot of fun. Not only was Zim v Eng my first time as a spectator at an international game, it’s also the last time I attended a game that didn’t involve Australia. Neutral games have copped a bad rap in Australia recently, being relegated to secondary channels on TV, or not being held at all, with bilateral series being preferred. In this World Cup we will see heaps of high-quality cricket involving other nations. I’m going to South Africa v India and Sri Lanka v Bangladesh, and unlike when they are playing against my home team, I’ll be hoping for De Villiers, Sangakkara and Dhoni to hit plenty of runs. The fans have certainly supported the neutral games – The India v Pakistan game in Adelaide is, as you would expect, a sellout, and even the first few games in Canberra are going to close to being sold out. It will be great to see packed stadia in Australia and New Zealand when the home teams aren’t involved. Does the tournament really start before March? I think the format of the cup needs a bit of tweaking. In particular, there needs to be something done to add more value to the preliminary matches. Every team that makes the quarter finals is at an equal footing. I would have thought the ICC would learn the lesson of the 1996 tournament, when the top 4 teams from Pool A took on the top 4 from Pool B, in exactly the same format as this year’s tournament will be held, and all of the Pool B teams won. It was like the first few weeks of the tournament were entirely unnecessary. While there will be plenty of battles for the right to top the group and get the best seeding, the main thing is for the teams to finish 4th or better out of their pool of 7. Then it’s anyone’s to win on the day. The other thing that is of concern is that the format appears to be ensuring the eight biggest test match nations will qualify for the quarter finals. 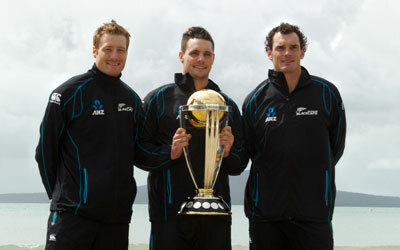 From Group A, Australia, New Zealand, Sri Lanka and England. From Group B, South Africa, India, Pakistan and the West Indies. In previous years (1999 and 2003 in particular), only six teams have made it to the second round – and this is a development I’d like to see return to add spice to more of the early matches. If we aren’t having a round robin “Super Six”, why not have a slight variation on the knockout matches – Teams that top the pool can go straight into the Semis, and the next best four can play an eliminator – A2 v B3, B2 v A3. Of course, in an era where TV money is king, the risk that the biggest nations miss out (like in 2007) is probably too big a risk for the ICC to take. Of course, even the best laid plans fall apart. Which minnow will take the spot of one of the big 8? I’m going to pick Zimbabwe or Ireland to knock off the West Indies. So who’s going to win? Of course I want to see Australia win and based on their form coming into this series (particularly their 4-1 series win over South Africa in November) they are deserved favourites. But, in early 2014 around the time that Corey Anderson belted the fastest hundred in ODI history, I put the princely sum of $5 on New Zealand to win the tournament at odds of $13. They are now paying $6 and are third favourites behind Australia and South Africa. I have seen nothing in the following 379 days since I placed that bet which makes me think it was a bad choice. I wouldn’t be surprised to see them holding up the trophy at the MCG on March 29th, and you’ll then see me wishing I’d put more money on them to win. Until then, if you’re looking for me, I’m probably at the MCG, or sitting in front of my TV watching Channel 503. Bring it on! This entry was posted in Cricket and tagged AB De Villiers, afghanistan, albury, australia, bangladesh, corey anderson, cricket, cricket world cup, cwc15, cwc92, england, icc, India, international cricket council, ken sutcliffe, kenya, Kumar Sangakkara, lavington, MCG, MS Dhoni, new zealand, rebel sport, south africa, sri lanka, west indies, zimbabwe. Bookmark the permalink.